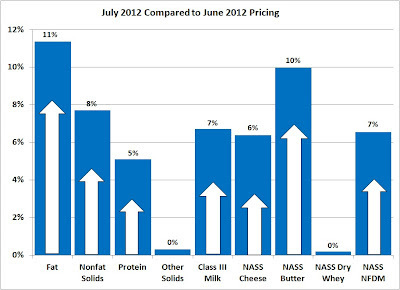 The Federal Milk Marketing Order July milk pricing showed an expected increase. What was unusual was that every parameter was up. Dry whey and the "other solids" price, which is calculated from the dry whey price, were up less than 1%, but the more important component pricing for milk protein and butterfat were up 5% and 11% respectively. 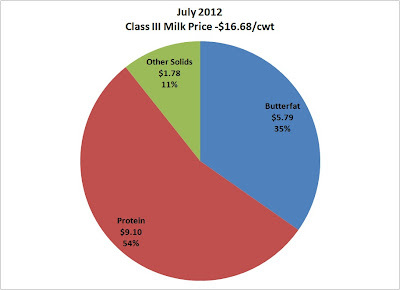 The Class III milk price increased by 7% to $16.68/cwt. Milk protein and butterfat prices are showing nice gains. 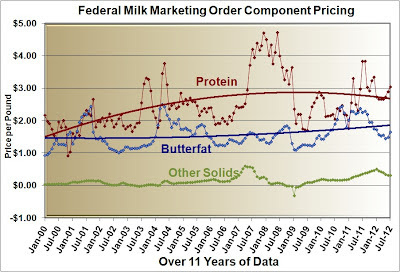 However, at $3.04/lb, milk protein is not even close to its all time high of $4.71/lb. 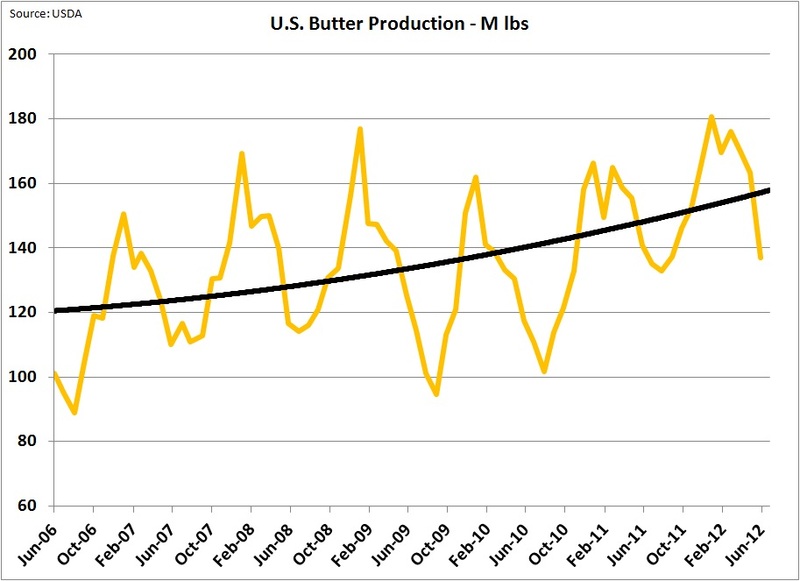 The highest price for butterfat in the last five years was $2.37 in June, 2011 which is also well above the current $1.66/lb. These comparisons are made to show the volatility of the milk component pricing and to show that under certain economic conditions, much higher prices can result. While the current pricing is above the long term averages, there is plenty of room for additional upward movement. The factors for these milk component increases are the butter and cheese prices. 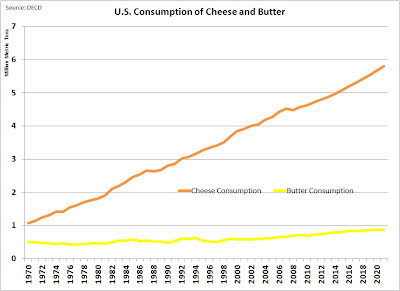 Butter was up 10% and cheese was up 6% over the prior month. 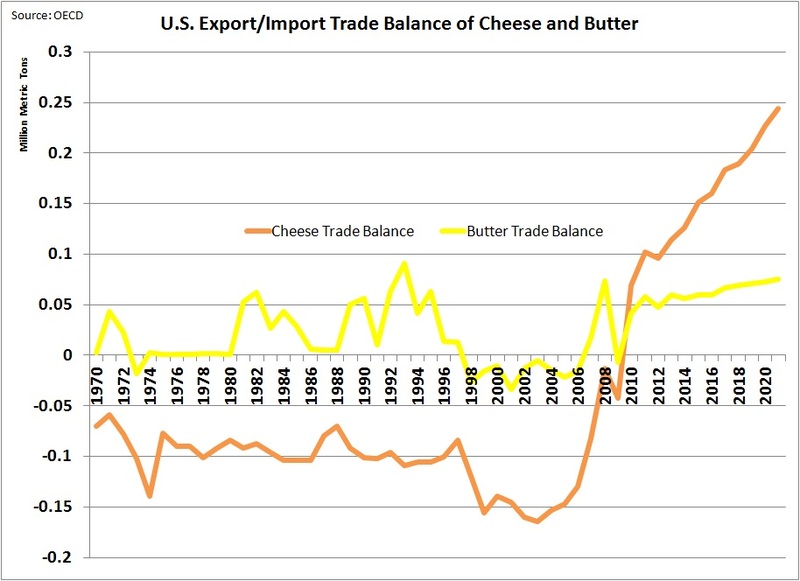 When butter increases, butterfat goes up in value, but milk protein goes down because the difference in the value of butterfat in cheese vs. butter decreases. 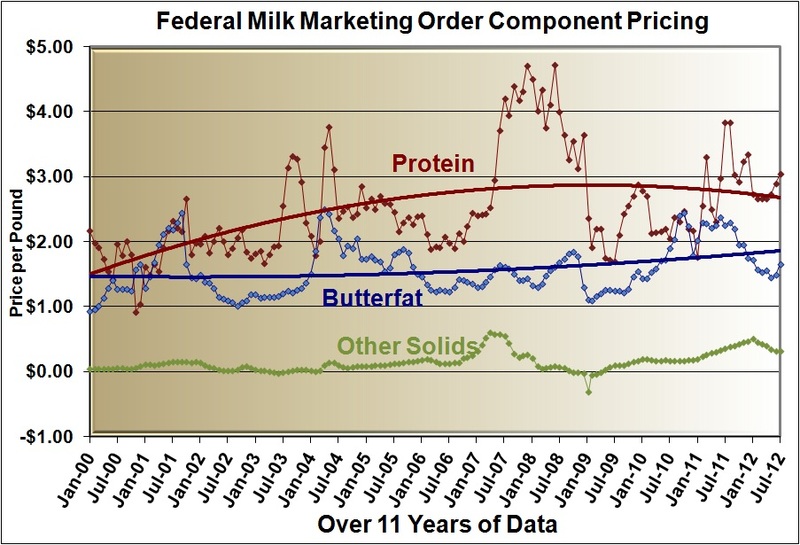 As analyzed in detail below, there appears to be a greater chance for milk protein to increase in value in the coming months than for butterfat. With these changes, the milk check shifted again emphasizing the importance of milk protein in producers' checks. 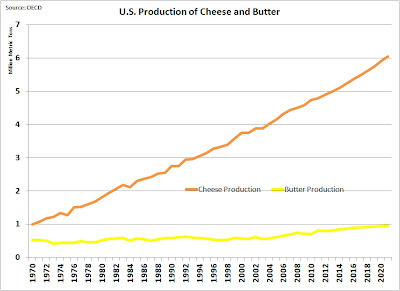 Before analyzing the current trends for cheese and butter pricing, a few charts will be shown on why protein is such an important long term focus for producers. Protein is necessary for cheese production (see Van Slyke's book on "The Science and Practice of Cheese-Making" for details). Often non-fat dry milk is added to bring milk protein to the optimal levels for cheese production. Processors need milk high in protein to economically manufacture cheese. 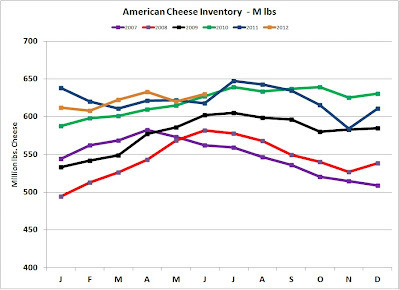 Cheese is the growth vehicle for the U.S. dairy industry. The data shown below is from the OECD (Organization of Economic Co-operation and Development) database. 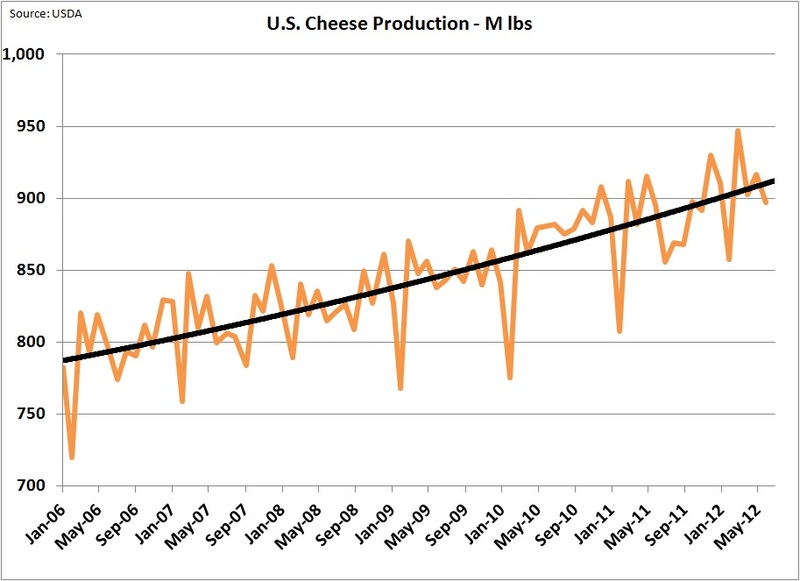 U.S. cheese production has been growing, is growing and is expected to continue to grow. Butter will see only slight increases. The chart below follows exactly the pattern of the one above, but reflects increasing consumption. 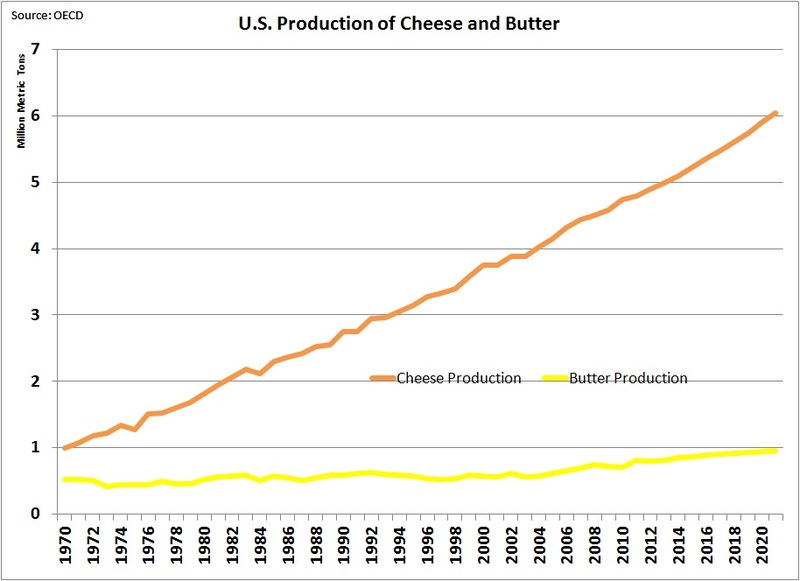 As with production, cheese consumption has been growing, is growing and is expected to continue to grow. Butter will see only slight increases. The trade balance is the net of exports minus imports. 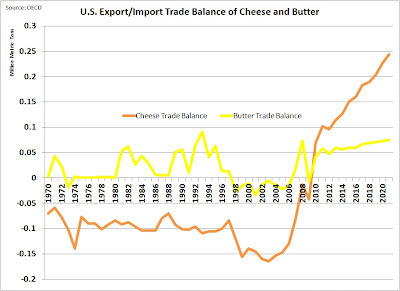 The cheese trade balance became positive (exports larger than imports) starting in 2010. This trend is expected to continue. 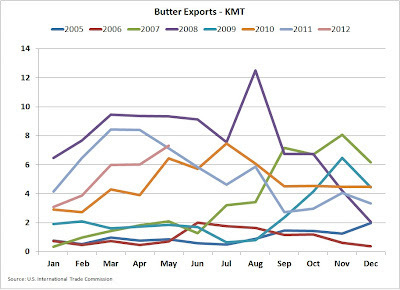 While the butter trade balance is expected to remain positive, only a small increase in tonnage is expected. 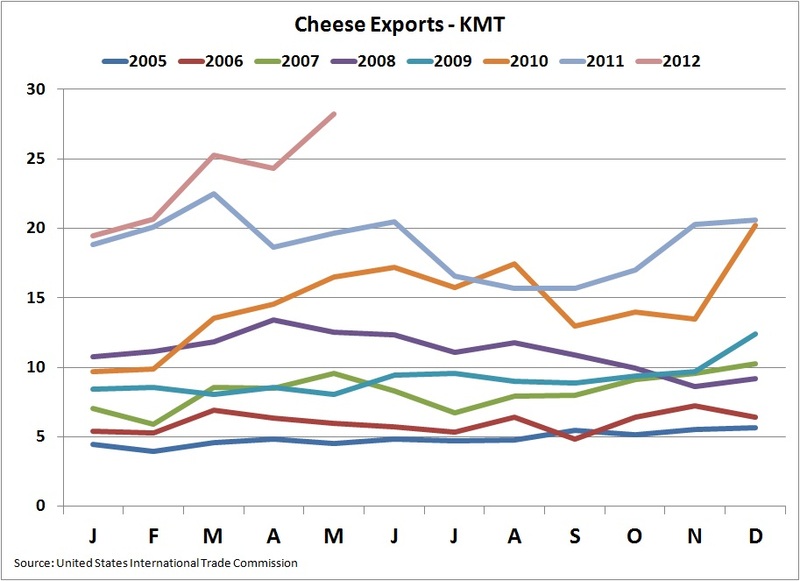 The demand for cheese, driven by strong exports, is continuing and with higher demand, a higher price can be expected. Exports continue to set new records. 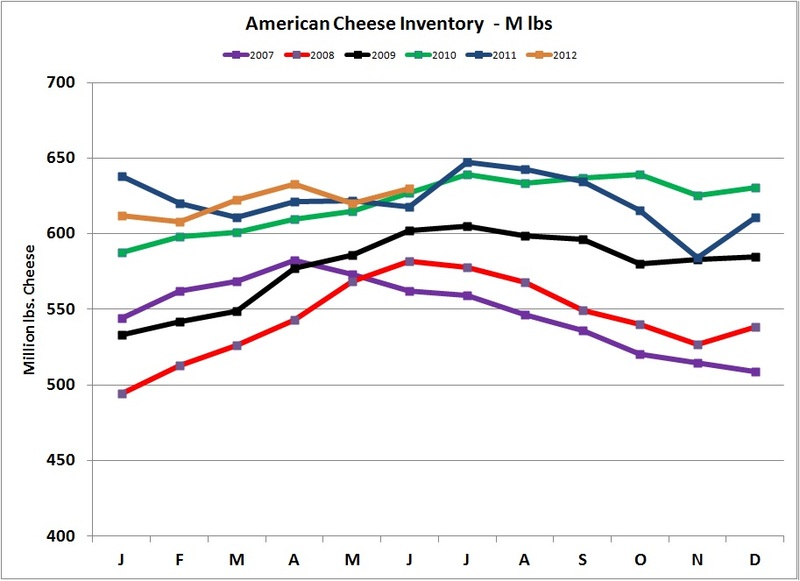 Cheese inventories are staying in line with normal expectations. Although export data lags by a few months, through May, exports are very strong, approaching 30 thousand metric tons per month. This is occurring even with a relatively strong USD. As the future of the EU evolves, it is possible that the Euro may weaken further against the USD, but the ability to increase exports in the current economic environment indicates that the U.S. 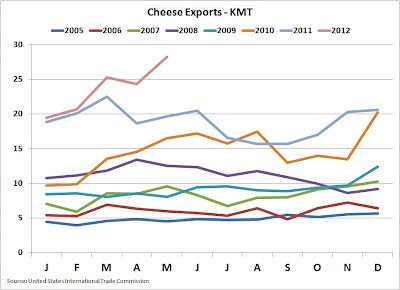 Dairy business is remaining competitive on the world markets. Inventories have remained in line with the last two years levels even though production has climbed. 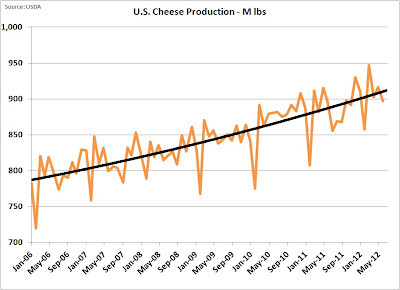 Cheese production continues to increase following the historical trends. 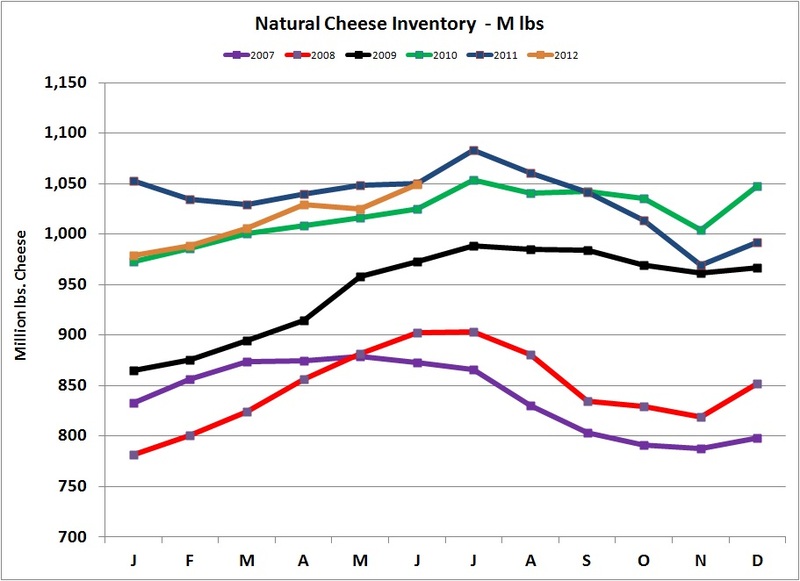 Overall, the cheese market seems to be in a very healthy position. Butter statistics show a market that is stable, but with no significant movement. 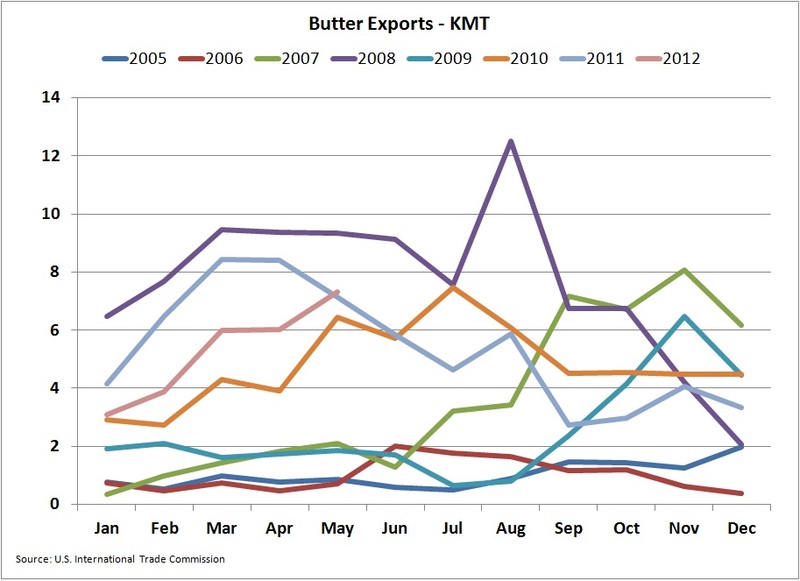 Butter exports remain near the levels of 2010/11. 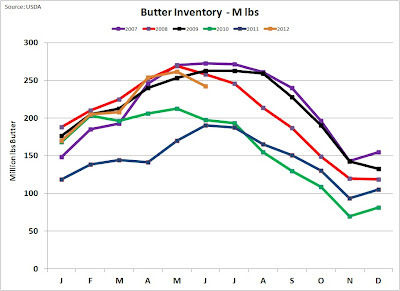 Butter inventories are reasonable for this time of the year. They have recovered from the low levels of 2010/11. 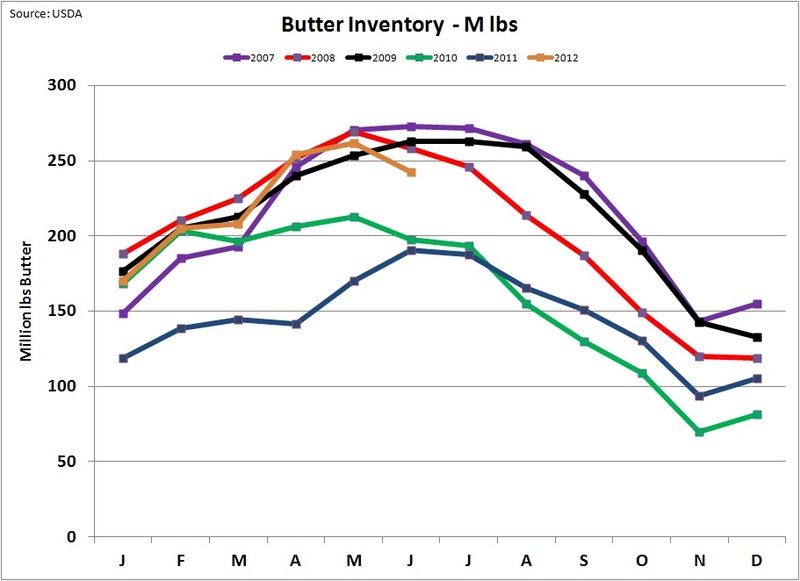 Butter production is following normal seasonal patterns, but July does show a little weakness. 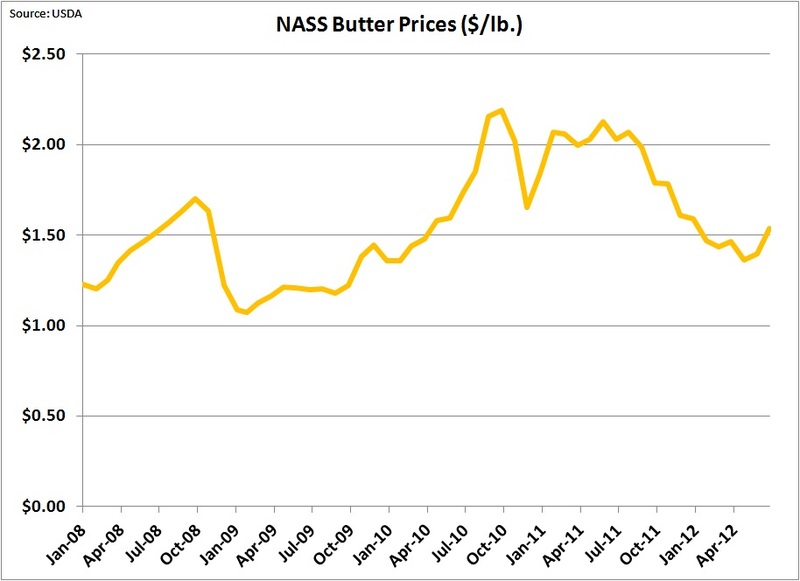 Therefore butter prices remain near historic levels. 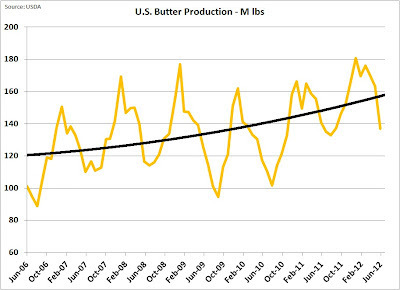 There is not much movement concerning butter regardless of the 10% price increase that occurred in July. The 2012 summer heat may come into play in butterfat availability and may be contributing to the recent price increase. New month's data will tell more on this. 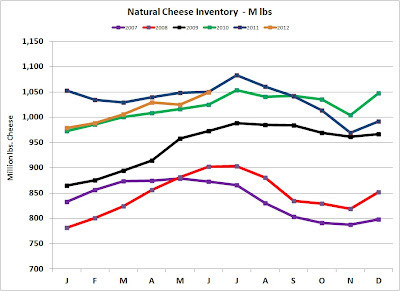 The summer heat and the Midwestern drought will impact dairy prices and profitability. High feed costs will probably force a reduction in the number of cows and the number of dairy operations. Margins will be slim. However, the milk futures do show expected improvement in milk prices. Some producers may take advantage of the higher futures prices to lock in margins. Those looking further into the future should look closely at the genetics and nutrition needed to impact higher milk protein levels.